Since 1999, Healthabitat has completed 184 projects in remote and impoverished communities, improving the condition of 7308 houses for over 42,000 people. Formally established in 1994, the organisation has a history that stretches back to 1985, when its three directors Dr Paul Torzillo, Stephan Rainow and Paul Pholeros first met in the Anangu Pitjantjatjara Yankunytjatjara Lands, north-west South Australia, where they had been thrown together to work with a team of local Aboriginal people to help improve local health and housing conditions. Since that first meeting, the trio has gone on to orchestrate a slew of research programs, lauded not only for the wealth of hard data they have produced, but also for genuinely improving conditions. They have achieved this through a policy of ‘no survey without service’, focusing their research around maintenance and construction programs, first and foremost, as opposed to just observation and data gathering exercises, thereby effectively redirecting grant money towards actual, immediately effective outcomes. This pragmatic and results-oriented approach underpins much of the organisation’s philosophy, and it has become highly adept at focusing limited resources in areas where they are likely to have the most impact. Healthabitat has channelled the outcomes of its research into several publications, regarded by many as the most robust and comprehensive accounts of how to improve health in indigenous communities by improving living conditions – Housing for Health: Towards a better living environment for Aboriginal Australia (which was awarded the Royal Australian Institute of Architects President’s Award in 1994) and the first and second editions of the National Indigenous Housing Guide. These publications identify nine ‘healthy living practices’ that contribute to healthier communities, prioritised in order of their likeliness to improve health, and the facilitation of these practices underpins all of the work that the organisation engages in. For a number of years, Adrian Welke of Troppo Architects has been working with Healthabitat in the design and construction of health buildings in remote areas. It was with Welke that Healthabitat first starting exploring the potential of prefabrication as a means of delivering high quality buildings, efficiently. Welke’s most recent project with Healthabitat is a prefabricated wet room unit, designed to be ‘clipped on’ to the back of existing residential buildings. Containing shower, laundry and toilet, the unit addresses the top three of the nine healthy living practices – ‘washing people’, ‘washing clothes’ and ‘waste removal’. As a prefabricated unit it is also a very efficient means of delivering what are traditionally the most expensive components of a residence (the laundry, toilet and bathing areas). 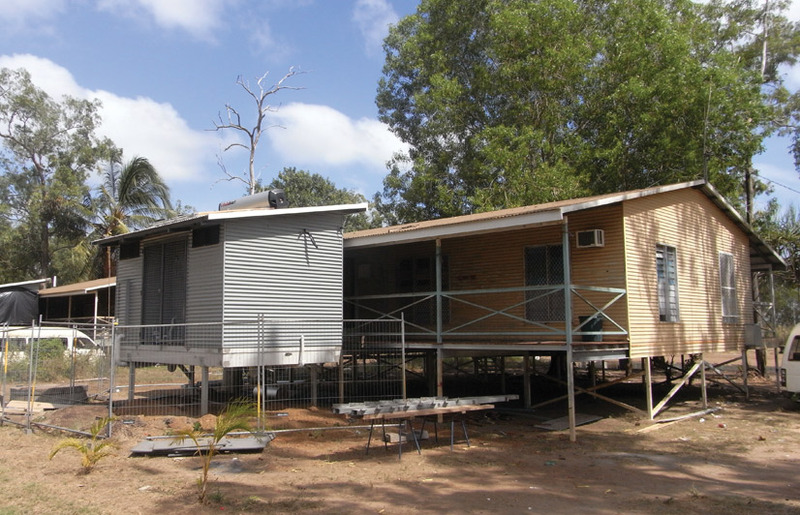 In keeping with Healthabitat’s modus operandi, then, the project focuses resources in areas where they are likely to have the most impact, and after a successful prototyping stage, units are now rapidly being deployed to indigenous communities across Australia. Architectural Review Australia recently caught up with Paul Pholeros to discuss this latest project, and the ongoing challenges Healthabitat faces in its struggle to improve the lives of some of Australia’s most disadvantaged and disenfranchised people. Maitiú Ward: Healthabitat has been working for a number of years with prefabrication in remote communities. Could you tell us a little about the prefabricated wet room unit you have been prototyping and deploying? Paul Pholeros: Adrian Welke of Troppo Architects was commissioned by Healthabitat to design, detail and construct the prototype. Healthabitat gave Troppo a very specific brief, based on all the data we’ve got for why things fail in wet rooms. We’ve got a mass of data on over 7000 houses as to what goes wrong in those areas, down to details like why the taps fail, why floor finishes fail – you name it. The briefing point was then to make a unit that you clip on to existing houses. The key need was to retrofit because we know the cost of getting trades out to do a shower, laundry and toilet upgrade in a remote area is almost always too expensive. Troppo had to consider things such as how to get these units to the back of a house. Rarely are the shower, laundry and toilet on the front of a house. We can’t afford to take cranes out to remote sites because it’s too expensive, so they developed dolly wheels and wheels that go underneath. In the worst case, four or five blokes can actually push one of these units on a steel plate on the ground. These are really key issues; they don’t sound that important, but unless you’ve got that sorted, you actually can’t get the unit to where you want it. So, it’s a very broad and complex brief. You’ve obviously been doing this for a very long time, accumulating all this empirical data. That empirical approach is very unusual in architectural design. What does your architectural expertise bring to that process? Why an architect rather than an engineer, for example? That’s a good question. Of the other two directors of Healthabitat, one is a medical doctor, and the other is a public and environmental health specialist. So, I’m the odd one out. The one thing that I think architects are trained to do is look at coordinating a myriad of forces to get a result. I think if anything, that’s the main skill I use. Healthabitat ringmasters a huge range of skills, but our ultimate aim is incredibly simple – we have to reduce the illness rates of kids nought to five. That’s the measure of success. Not whether the building looks good, not whether the building is even cost-effective. We have to do that as well, but the ultimate measure is: do kids get healthier? And then, do adults get healthier? Recently a study was done by the New South Wales Department of Health showing that by doing these small incremental works, some of which are architecture, some of which have nothing to do with architecture – fixing toilets, fixing light fittings – they had a 40 percent reduction in people going to hospital through illness, compared to a control group from around the state where we hadn’t been doing projects. Forty percent is staggering. Our doctor thought 10 percent would be a great result – that would be equivalent to a successful drug trial. But we got 40 percent. In fact, it was so big, they sent it overseas to be checked twice to make sure they hadn’t actually made a mistake with the data. So, why an architect? It doesn’t have to be. It could be an engineer. We use industrial designers, we use engineers. Adrian and Troppo we’ve used for a lot of years as an architect. We’re a very broad church. I happen to think that is what is almost the most important ingredient of Healthabitat, so it doesn’t become purely about buildings. That would be a huge mistake. Buildings have to do something, whether it’s the house, whether it’s the shower block. They actually have to achieve a result. Why have you specifically isolated housing wet areas for attention? Of the top three priorities of nine health priorities in strict order, the first one is washing the kids once a day, the second one is washing clothes and bedding, and the third one is removing human waste safely. So, those top three are all dealt with in the shower, laundry and toilet. Beyond that are life-threatening safety things that will kill you today, like bare wires hanging out of the wall. And just as a little clip on, we’ve also put a water filter into the unit, which sends a pure water stream to the kitchen. They get seven litres a day out of this reverse osmosis filter. So, for nutrition, the family gets seven litres of very pure water, it saves them buying it at the shop. It doesn’t sound a lot, but seven litres a day for a family is not bad. In many places we work, you can’t drink the water. So, people either buy soft drink, drink strong tea – they drink stuff that isn’t necessarily good for you. With regards to design development, what kinds of considerations beyond cost and construction efficiency come into play? Some very simple ones. The floor plan has to separate the three activities – toilet, shower and laundry. It sounds obvious but many of the houses we work in are highly overcrowded, so you increase the chance of a kid having a shower in the morning if it’s not combined with a toilet or a basin type. Many houses would have that. So, if someone is using the toilet, the kid doesn’t get a shower. And if you’ve got three families sharing a house, you dress completely in the shower and undress, so you need hooks, a seat, things like that, so your clothes don’t get wet. We’ve also now included a baby wash, instead of a straight laundry tub – it has an incline that allows babies to be washed more safely. Again, our target group is kids nought to five. The ambition with these units is to have them going into sites all across Australia. I’m assuming conditions will vary quite significantly. How does the design respond to that challenge? Conditions vary significantly, but once you leave the coast, it’s fair to say that most water will have a negative impact on taps and equipment. In some places, it’s a dramatically different impact. Others, it will take five years to deteriorate, not three months, but still you have to handle it. So, it’s a case of specifying for the worst possible scenario, effectively? It is, without question. And then we’ve got things like rats or native mice that love attacking pipe work. So, sealing all the services is crucial. We’ve also designed the prototypes so that there’s a bay that allows access to the backs of every tap and appliance, so that everything can be changed from behind the wall without having to remove any of the wall materials. So with regards to the maintenance program, has Healthabitat been closely involved in that? Most of the work that we do in the housing for health projects comes about because maintenance simply isn’t done. The track record on this over 25 years is that state governments who get large amounts of money to do maintenance on indigenous houses rarely do it. The maintenance is appalling. Part of our program is to train up local people to do it, because we reckon that’s probably the only chance they’re going to have of getting maintenance done. So, we certainly haven’t solved the maintenance problem, and I won’t pretend we have. But that’s a state government or housing department job. These are public houses. People pay rent. They should be getting maintenance – they don’t. It’s a national scandal. All we can do on the design front is to make things as robustly as we can. Obviously they’re heavily trafficked as well, these areas. So, the local guys that you’re training to do the maintenance, they’re funded by local government? They’re funded by our projects. We go in and generally that’s federal money or state money. Sometimes communities are chucking in their own money from maintenance moneys they’ve collected, and they want us to train a bloke, even if it’s just so they can go through a house and carefully check every bit to identify what’s not working. But there are a lot of incredible skills in these communities. If you give them some tools and you give them some basic training, they can do a hell of a lot. We try and keep some money going to them. That’s the key. Long term, someone has to be paying for this to be done. Effectively you guys move in and devote part of your program’s resources to training these guys up and then it’s an informal system from then on, unless the government gets involved? Exactly. And we’ve been pushing this for over 20 years – it’s not a lot of money. It’s trickling some money in to keep these guys going – guys and women. In fact, women are probably much better than men in doing the job because they don’t feel like they know a lot about housing, and that’s a great advantage because they’re much more cautious and careful about their checking. Often women have kids and grandkids, and they see that the link is about the health and safety of those kids, therefore it has a priority, whereas men tend to see a house as a set of objects, a set of things. I think my view of the world is we change the culture. Aboriginal people move around now and are getting far more able to say, “We want to know what taps you’ve used. We want to know that the pipes are well protected from mice.” They actually do know a lot about the requirements. Is that as a result of just years of experience with shoddy housing, or something to do with the training and maintenance program? We get people working with us for a year, and we’ve worked in 184 communities around Australia over the last 10 years alone. We have had over 4500 staff in that time. Each of those people has spent a year going through houses and looking at them in great detail, and they’re pretty cluey. So, when there is a housing meeting, a lot of them front up and say, “Listen, what switches are you going to put in? You’re not going to put in those really cheap nasty ones because they’re just going to fall apart – and this is how they’ll fall apart. Whereas if you put this sort of switch in, it won’t fall apart.” So, young consultants often get a pretty good lesson in architectural detail from some of the old men and women of these communities, and they don’t expect it. This is so inspiring. It is so great to see this form of careful, functional, entirely context-appropriate design documented and celebrated. Wow, what amazing, pragmatic and respectful work. A lovely article. Thanks.